The song is taken from the band's forthcoming album, Stay Together, which is set for release on 7 October. Kaiser Chiefs have released the video for their Parachute single. 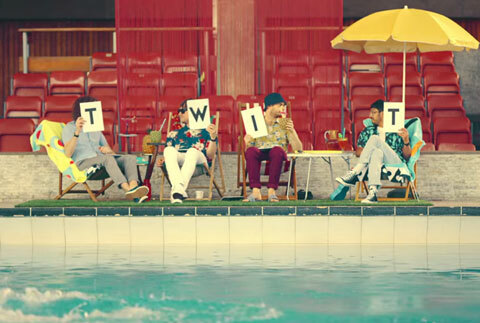 The promo sees frontman Ricky Wilson don various costumes as he launches himself off an olympic diving board. Despite the I Predict A Riot singer being pretty impressive in the water, his bandmates are clearly unimpressed. Speaking about the single and their new sound, Wilson said: “When we wrote the first record we were very direct, little needed explaining. The songs seemed to speak for themselves and did all the hard work for us. "Parachute is pretty self-explanatory and a bit of a return to that. Parachute is probably the first love song we’ve written since Ruby”. The single is available now and comes free when fans pre-order their new album, which set for release on 7 October. The band have also announced an exclusive show at the London Palladium on 11 July. Meanwhile, Kaiser Chiefs are set to play a series of sold-out Forest Shows, alongside appearances at V Festival, T in The Park, Ibiza Rocks, Rock Werchter, Boardmasters and Lollapalooza in Berlin.